COLLINS J.G. and WATTS C.W. The postage stamps of New Zealand. Vol. V Royal Philatelic Society of New Zealand 1967 xxix + 818pp + colour plates. 1st ltd. ed. of 1000 copies, fine in slightly torn D/W. 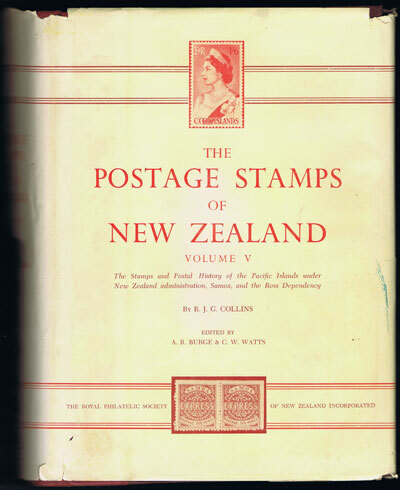 Handbook covering the covering the stamps and postal history of the Pacific Islands under New Zealand administration, Samoa, and the Ross Dependency.